Universal aluminum shoreline and dock stairs make lake access easy and safe. The stairs feature extra wide and extra deep non-slip steps that measure 24 inch wide by 5.5 inch deep. The 7 inch rise is a comfortable step height for people of all ages and pets. The 20 inch adjustable drop legs make the stair system safe and stable for any application. The stairs are mounted at a 450 angle and can be installed on any dock (hole drilling may be required). Constructed from marine grade aluminum with a natural aluminum finish. This beautiful 3 step Aluminum Dock Ladder was made to get into the water and to facilitate getting out of the water. Its very deep 5 steps are easy to climb and comfortable to assure foot comfort and its smooth rounded arches made of strong 1 in. diameter tubes can be securely grabbed by small children's hands. 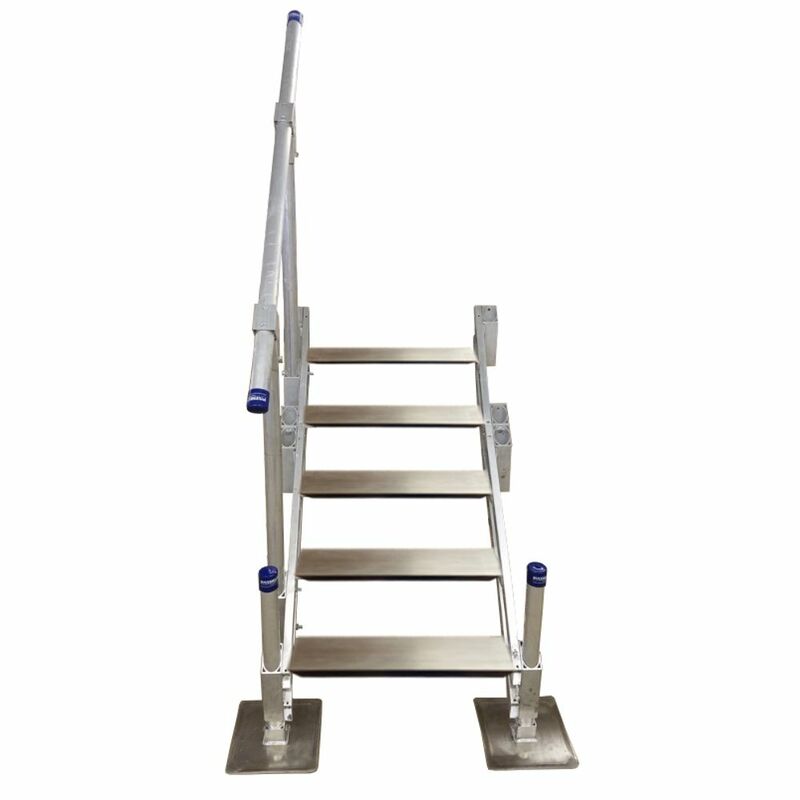 This Multinautic Dock Ladder will fit on any Aluminum or wooden Dock, stationary or floating, and can be rapidly installed and removed with its J Hooks securing system. 5-Step Aluminum Stairs with Handrail Universal aluminum shoreline and dock stairs make lake access easy and safe. The stairs feature extra wide and extra deep non-slip steps that measure 24 inch wide by 5.5 inch deep. The 7 inch rise is a comfortable step height for people of all ages and pets. The 20 inch adjustable drop legs make the stair system safe and stable for any application. The stairs are mounted at a 450 angle and can be installed on any dock (hole drilling may be required). Constructed from marine grade aluminum with a natural aluminum finish.